This is my second beer from the Sebright Arms Homebrew Project, the first being a stonking Black IPA brewed in collaboration with local artist 'Pure Evil'. 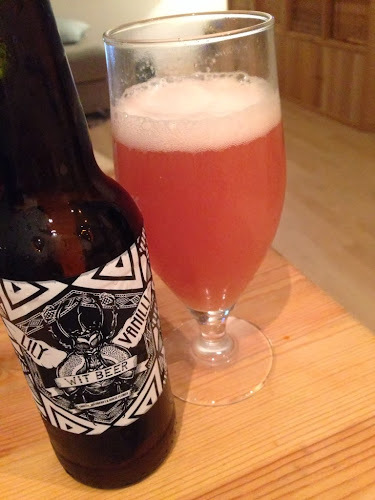 The collaborator this time is Lily Vanilli, with another stunningly designed label but a very different beer inside - a Belgian style wit (wheat/white) beer brewed with English wild berries and a Gorse Flower, whatever the hell that is. As I popped the cap of this beer it exploded like a Las Vegas watershow, with pale pink foam rising an inch above the bottle and flowing down the sides. Not to worry, these things happen and its a wit anyway, so no issues with the yeast being all mixed into the beer. When I eventually got it into a glass the first thing that jumps out is the bright pink grapefruit colour. Very unusual looking, with those berries and flowers tinting the pale wheat malt base quite dramatically. The aroma has a hint of wet leaves and an ever-so-slight hard cheese edge which reminds me of some traditional ciders. It's not an unpleasant smell but it isn't exactly inviting either. The taste is much more subdued. With a saison like sourness sitting alongside a floral, rose petal note and not a lot else. Further investigation reveals a fleeting orange fruitiness and a brief drying in the finish, but apart from that there isn't a great deal going on. It's underwhelming but interesting - and quite refreshing in a watery kind of way. That said, perhaps the exploding nature of my bottle was evidence of an infection or something else gone awry during bottling. Equally, perhaps I'm judging this a little harshly after the excellent Black IPA they brewed last time around - if you've tried this beer and had a better experience then I'd love to hear your thoughts.